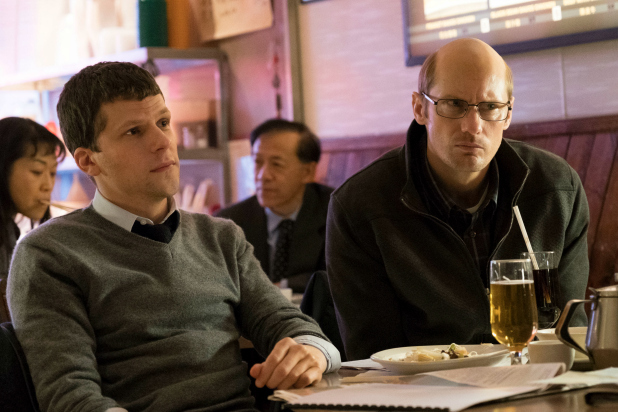 Jesse Eisenberg brings his unique brand of freneticism to a film informed by the speed of a hummingbird’s flutter of its wings; technological wizardry based on the prescience of a fiber optic “line” running underground from Kansas to New Jersey, resulting in vast profits, in milliseconds, on the stock market; Jesse is “Vincent Zaleski” a high-frequency trader, along with his cousin “Anton Zaleski” (remarkably bald but stunning Alexander Skarsgard) a genius, flirting with the savant spectrum, know their success lies in converting the uneducated of the eventual value of their cunning “eminent domain” mission. Their ex-employer “Eva Torres” (Salma Hayek, convincingly viperous, as a woman wronged), not to be bested, matches the boys “line” against her “wind towers” . The race, with all its messiness, humor and humility, takes a circuitous route to the finish “line”. Writer/director Kim Nguyen’s intelligent, quirky, comprehensive tale of the world’s shrinkage, information glut, and its unrequited thirst for more, leaves viewers pondering the quest, evaluating the pace of a millisecond, and in the end, its worthiness.